Herraiz Roda JL, Maazouzi Y, Llueca Abella A, Delgado Barriga K, Piquer Simó D, Guijarro Colomer M, and Cañete Mota A. 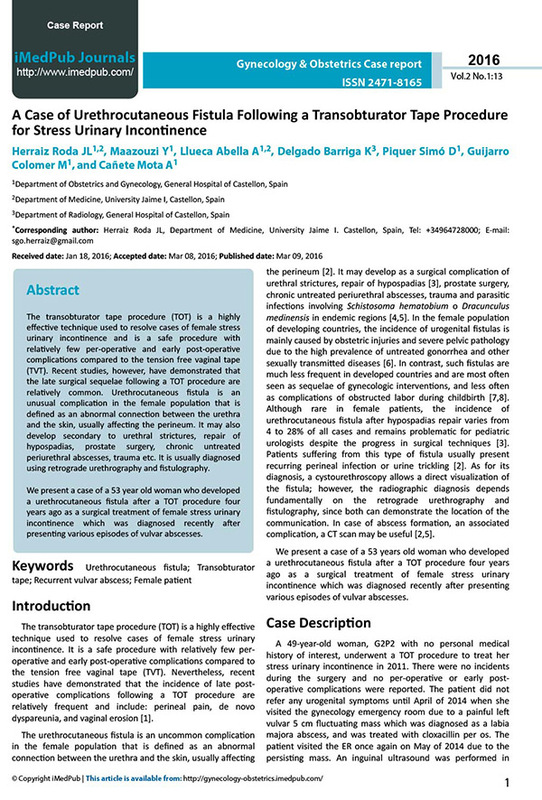 The transobturator tape procedure (TOT) is a highly e ec ve technique used to resolve cases of female stress urinary incon nence and is a safe procedure with rela vely few peropera ve and early post-opera ve complica ons compared to the tension free vaginal tape (TVT). Recent studies, however, have demonstrated that the late surgical sequelae following a TOT procedure are rela vely common. Urethrocutaneous stula is an unusual complica on in the female popula on that is de ned as an abnormal connec on between the urethra and the skin, usually a ec ng the perineum. It may also develop secondary to urethral strictures, repair of hypospadias, prostate surgery, chronic untreated periurethral abscesses, trauma etc. It is usually diagnosed using retrograde urethrography and stulography.